22 weeks after Walmart agreed to remove shirts bearing Nazi iconography from its shelves, and 10 weeks after getting a letter from Congress demanding the shirts removal, they’re still there. 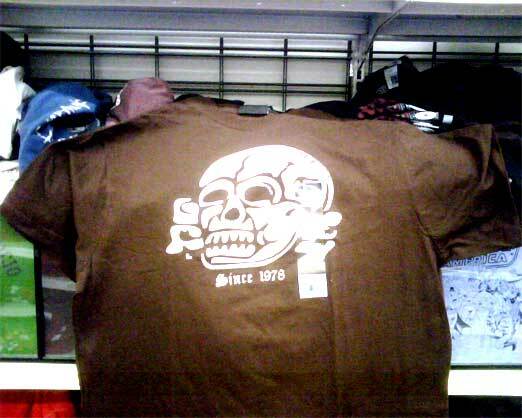 15 weeks after Walmart agreed to remove Nazi tshirts from its shelves, they’re still there. Walmart’s Nazi Tshirts are in the Chicago Tribune, and drawing the ire of members of Congress, thanks to the dogged flow sightings and pictures by Consumerist readers published on this site. Walmart responded to a letter from Congress exhorting the retailer to remove tshirts bearing Nazi insignia, apologizing for letting some shirts fall through the cracks, as evidenced in a statement forwarded to us by a hill source. 12 weeks after t-shirts bearing Nazi insignia were discovered in Walmart, the retailer has yet to remove them from all their stores, despite initial promises to do so within days. Walmart Calls Nazi Shirts Still On Shelves A "Training Issue"
The Hobbs News-Sun ran a front page story this week about how t-shirts bearing Nazi insignia could be found on local Walmart shelves, nearly three months after the store promised to pull them. Last week we asked our readers to create captions for this picture of a fine feline on a Nazi insignia shirt sold by Walmart. 10 weeks after t-shirts bearing Nazi insignia were discovered in Walmart, the retailer has yet to remove them from all their stores, despite initial promises to do so within days. Sixty-six days after t-shirts bearing Nazi insignia were discovered in Walmart, the retailer has yet to remove them from all their stores, despite initial promises to do so within days. Sixty-two days after t-shirts bearing Nazi insignia were discovered in Walmart, the retailer has yet to remove them from all their stores, despite promises to do so within days.